As Hindus in Malaysia and around the world gear up to celebrate Thaipusam on 21 January, we take a look at six interesting facts about the festival. 1) The name Thaipusam comes from Tamil – ‘Thai’ referring to the 10th month in the Tamil calendar, and Poosam being the name of a star in the Cancer constellation. During the festival, the star is said to shine at its brightest. 2) Thaipusam is dedicated to the Hindu deity Murugan, son of Lord Shiva. Legend has it that Lord Shiva sent Murugan to help devotees who were being plagued by asura(demons) Murugan emerged triumphant, appearing before devotees holding a golden spear and seated on a silver chariot. 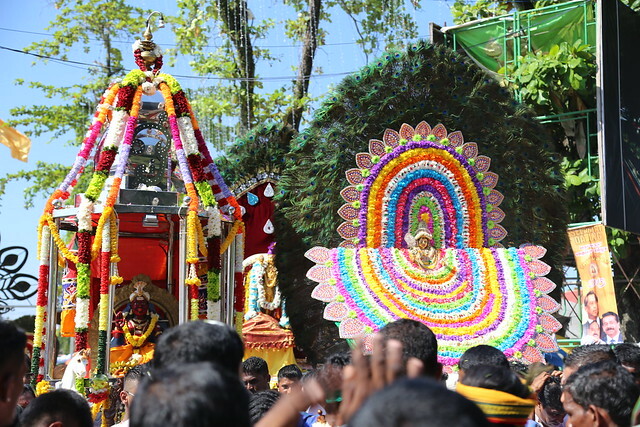 Today, devotees place the god’s image, adorned with flowers, on a chariot, which is borne around on a procession. 3) Thaipusam is celebrated where there are significant populations of Tamil Hindus, such as India, Malaysia, Singapore, Sri Lanka, as well as parts of the Caribbean including Jamaica, Trinidad and Tobago and Mauritius. 4) Hindus believe that Murugan is a dispenser of favours. The festival is a time for prayers and penance, with devotees pledging vows and undergoing self-mortification as a sign of gratitude and to implore for help to help their prayers granted. 5) The kavadi (burden) is most commonly associated with Thaipusam. Usually carried by male devotees, the large semicircular structure is affixed on the bearer’s body through hooks and chains. Women carry silver milk pots called paal kudam, and may also have parts of their body pierced. 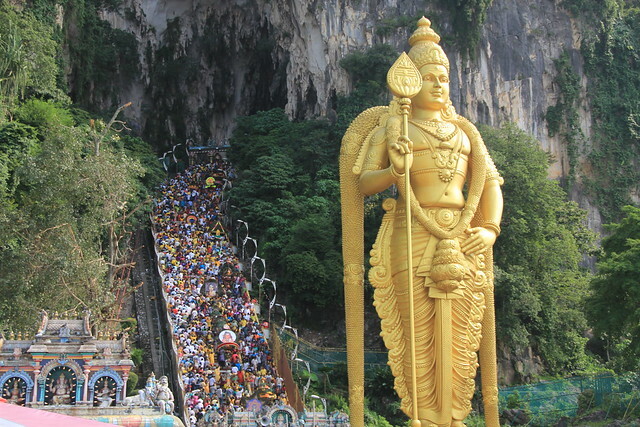 6) Thaipusam celebrations in Batu Caves, Malaysia is one of the largest of its kind in the world, attracting over a million devotees and thousands of visitors each year.